Kalamkari is a primitive art of hand painting done on cotton or silk fabric with a tamarind pen, using natural dyes. The word Kalamkari is derived from a Persian word where ‘kalam‘ means pen and ‘kari‘ refers to craftsmanship. This art involves 23 tedious steps of dyeing, bleaching, hand painting, block printing, starching, cleaning and more. This colorful technique dates back to more than 3000 B.C. The process of making Kalamkari involves 23 steps. From natural process of bleaching the fabric, softening it, sun drying, preparing natural dyes, hand painting, to the processes of air drying and washing, the entire procedure requires precision and an eye for detailing. Cotton fabric used for Kalamkari is first treated with a solution of cow dung and bleach. After keeping the fabric in this solution for hours, the fabric gets a uniform off-white color. After this, the cotton fabric is immersed in a mixture of buffalo milk and Myrobalans. This avoids smudging of dyes in the fabric when it is painted with natural dyes. Later, the fabric is washed under running water to get rid of the odour of buffalo milk. The fabric likewise, is washed twenty times and dried under the sun. Once the fabric is ready for painting, artists sketch motifs and designs on the fabric. Post this, the Kalamkari artists prepare dyes using natural sources to fill colors within the drawings. Incorporating minute details, the Kalamkars use ‘tamarind twig’ as pen, to sketch beautiful motifs . Kalamkari art primarily uses earthy colors like indigo, mustard, rust, black and green. Natural dyes used to paint colors in Kalamkari art is extracted for natural sources with no use of chemicals and artificial matter. 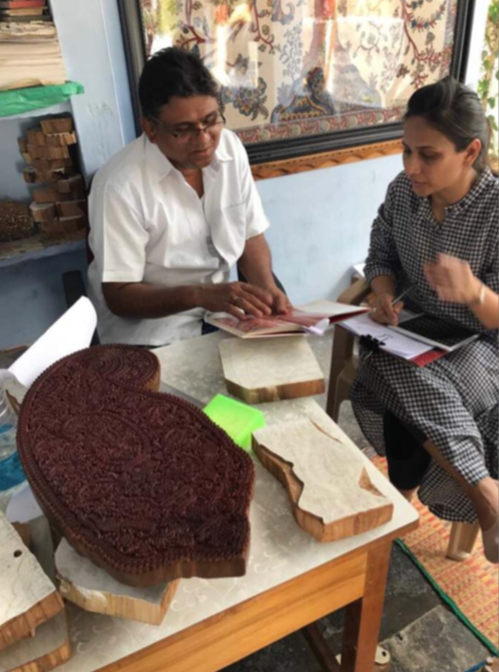 For instance, craftsmen extract black color by blending jaggery, water and iron filings which they essentially use for outlining the sketches. While mustard or yellow is derived by boiling pomegranate peels, red hues are created from bark of madder. Likewise, blue is obtained from indigo and green is derived by mixing yellow and blue together. Due to the tedious technique involved in its making, Kalamkari art is losing its fluoresce. Global warming , increasing pollution, disease and facts which prove that textile industry is one of the biggest pollutants, forces a responsible citizen of the planet to think about a solution. Using natural dyes, natural fabric and organic living is an obvious choice. Sustainability is not merely a trend but a way of living , therefore with the market becoming more conscious of the benefits of avoiding chemicals , soon the consumers would understand and value sustainable clothing, it is the way to be , it is the present and the future. At Divya Sheth, we aim for zero waste by using patterns which utilises maximum textile without wasting it such as off cuts and off- rolls, using leftovers creatively for tassels or packaging. Also, pattern making considers the minimum waste principle. We only use eco-friendly packaging - biodegradable packaging with jute, cotton etc.